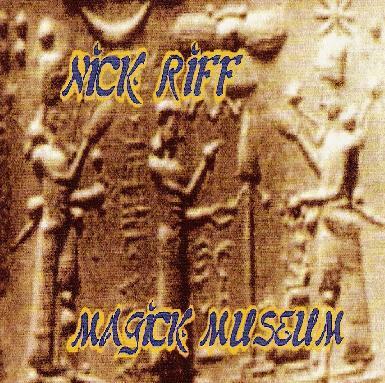 Nick Riff - "Magick Museum"
A veteran of the Cleveland, Ohio alternative music scene, Nick Riff is known to the world from the 2 albums he recorded for the great Delerium label in the 1990's, as well as contributions to numerous compilations. Though he seemed to have disappeared for a while, Nick is back in action with a new web site and his self-released Magick Museum, a collection of limited edition and out of print material, intended as an introduction to those who may have missed him in his 90's psychedelic heyday. The album opens hot 'n heavy with "Freak Element", a blazing punky psychedelic song that not only ROCKS but shows what a solid songwriter Nick is. This guy really excels at fusing psychedelic influences from a number of eras. The 60's are well in evidence, yet there's a freshness to Nick's sound that heads off the temptation to tag him as being too retro. "Forbidden Love" is another strong track with the song itself based firmly in the 60's, but the power rock pulse giving the music a potent hard psych rock attack. "Cloak of Immortality" and "The Other Ones" are bouncy psych-pop numbers with an injection of harder edged acid rock and great jam sections. Ditto for "Creature Feature", which is like something right out of a 60's dance party flick, but with Frankie and Annette heavily dosed while playing bingo on their beach blankets. And dig that space rock electronics landing in the last minute of the song. Awesome. "Mystified" is a short pop-psych song with elements of space rock. "Staring into Space" is a little different, being a short Pink Floyd like acoustic guitar and space synth piece. I would have liked to hear Nick stretch this one out a bit. "Vagabond Unknown" is one of the more space rock oriented tracks of the set, while never straying far from Nick's core song oriented psychedelic sound. Pop based space rock… actually the instrumental segment at the end sounds a bit like Neu!, and look how many freaky pop groups they influenced! Same for "Go Far Go Wide"… it's got that pop side of Neu! feel to it. And "Tribal Elders" and "Limitless Light" are THE most space rock oriented tracks of the set. In fact, if Daevid Allen were on vocals on "Tribal Elders" I could snow you into believing this were a long lost Steve Hillage era Gong tune. And I love that ripping looped guitar and droning pulsating synths and electro beats on "Limitless Light" Killer!! In summary, if you've not been tuned into Nick Riff before then you should head over to his web site and grab this collection right now. Of course the whole idea is to set the stage for some upcoming NEW music, and revisiting these songs has me hoping that happens very SOON.